WYTHE COUNTY, Va. – Tuesday morning at their regularly scheduled meeting, the Wythe County Board of Supervisors voted to name Stephen Bear as the county’s new administrator. Bear has served as assistant county administrator since November 2000 and will replace longtime administrator R. Cellell Dalton who will be retiring on Friday. A graduate of Rural Retreat High School and Hampden–Sydney College, Bear says he is looking forward to meeting the challenges of the position. “Wythe County is home to me, it’s the place that I have watched my children grow up. I appreciate being given this opportunity by the Board and look forward to continuing to serve the citizens of Wythe County,” said Bear. The incoming administrator also acknowledged the service of his predecessor. The Wythe County Parks and Recreation Department is now accepting applications for a part-time program assistant to help oversee and organize various community events and programs at the Sheffey Community Gym. An ideal candidate will possess the ability to plan and organize recreational events and programs for the public, as well as oversee “open gym” activities. 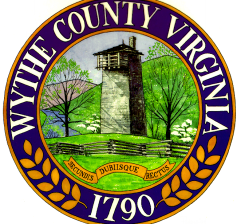 The part-time position will be responsible for working up to 20 hours each week and will be part of a new county initiative aimed at providing greater recreational opportunities to the citizens of eastern Wythe County. 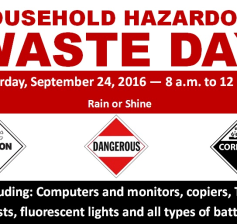 WYTHE COUNTY, Va. – The Joint Public Service Authority of Wythe and Bland Counties will be hosting its annual Household Hazardous Waste Disposal Day this month on Saturday, September 24, 2016.